Creating calculated columns in tabular models is deceptively similar to creating formulae in Excel. Deceptively, because the underlying language (DAX) is completely different, and you can make use of functions like SWITCH which have no Excel equivalent. This blog shows what calculated columns are, and how to create them. (For overseas readers, a pound is just like a dollar, but better). There are several ways to create these categories. This blog shows two: using an IF function, and using SWITCH. You can also use the EARLIER function to achieve the same result, as shown in a later blog. The final column gives the price category. You could then import the view created by this SQL into your tabular model, avoiding the need to create a calculated column. Here we've catered for the situation where the price is less than 5 pounds, but we still need to distinguish between the other two cases. The solution is to embed one IF function within another, although it doesn't look pretty! If the price is less than 5, show Cheap. Otherwise, if the price is less than 10, show Middling; otherwise, show Expensive. The different categories are calculated correctly. The syntax isn't obvious from this! Final Else If you still haven't found what you're looking for (shades of U2? ), use this value. 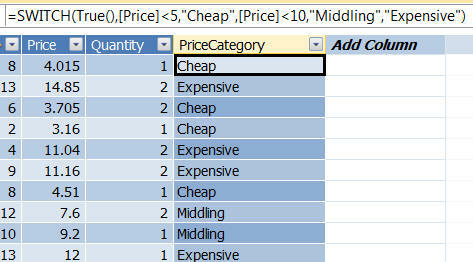 This formula returns the same price categories as did the nested IF function above. The arguments are explained below. The first argument in a SWITCH formula is often TRUE(), since you're often trying to find when a particular condition first becomes true. Firstly, see if the price for the row in question is less than 5 pounds. If it is, we've found something which equals the start expression TRUE(), so we can stop and return Cheap. If the price wasn't less than 5 pounds, move on to the next value, and test whether the price is less than 10 pounds. If it is, we've found something which equals the start expression TRUE(), and we can stop and return Middling. If the price wasn't less than 5 pounds and wasn't less than 10 pounds, we've run out of conditions, so the Else argument is assumed to equal Expensive, and this is returned from the formula. One final note about the SWITCH function - internally it's converted to a nested IF function before running, so it won't actually save any processing time.